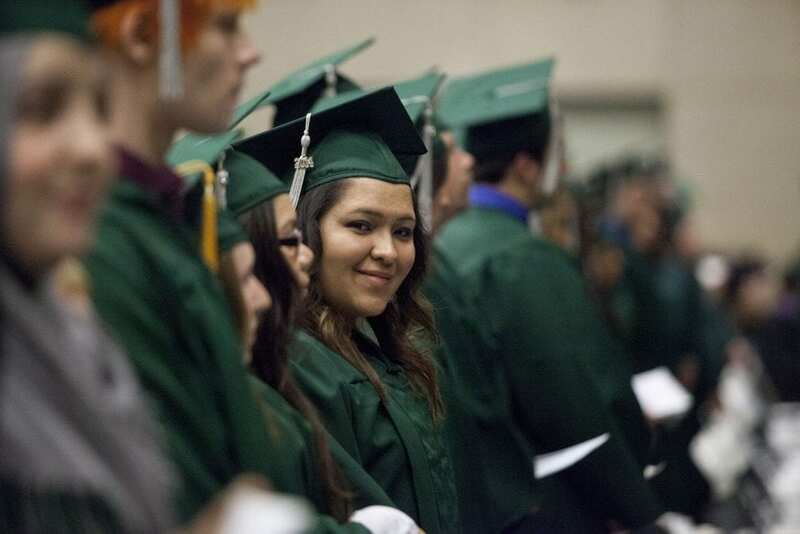 More Latino students are enrolling in four-year colleges and universities than ever before. But what happens to these students after they arrive on campus? Do they leave with a degree? Simply attending college does not provide the personal or broader social benefits that come with completing a degree – particularly a bachelor’s degree. Just 17.8 percent of young Latino adults, ages 25-34, hold a bachelor’s degree compared to 43.7 percent of young White adults. 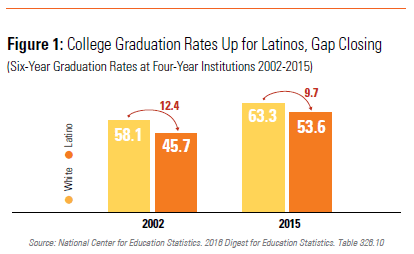 Improving college completion rates for Latino students can go a long way toward fixing this inequality. 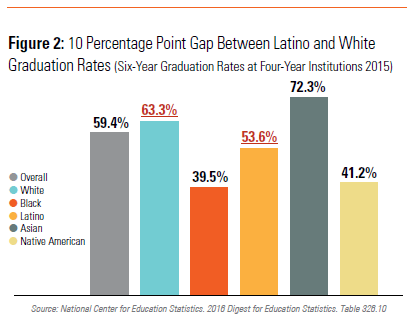 A little over 5 in 10 (53.6 percent) Latino students who start college as first-time, full-time freshmen at four-year institutions earn bachelor’s degrees from those institutions within six years — a rate 10 percentage points below that of their White peers. 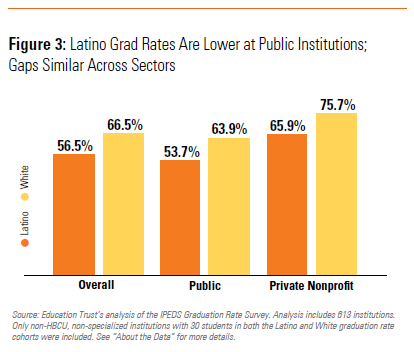 Improving completion rates at the low-performing institutions where Latino students are more likely to attend. 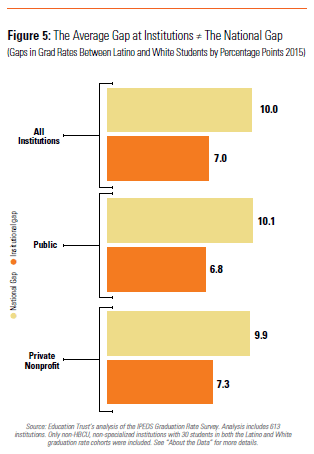 Well over 80 percent of institutions in the study had some gap, with 32 percent having a gap of 10 points or more. Institutional leaders must be intentional about student success. And there are institutions that are leading the way in equitably graduating their students. Take Whittier College in California. At Whittier Latino students graduate at a rate 5.5 percentage points higher than White students. 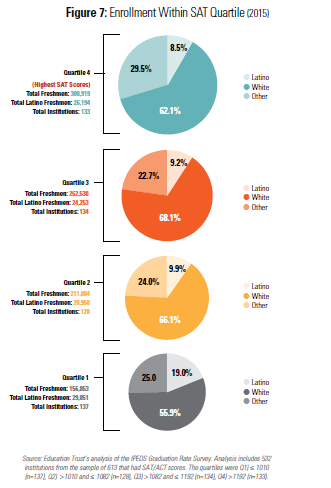 What’s even more impressive is that when compared with peer institutions, Whittier’s Latino student graduation rate is 20.3 percentage points higher (CollegeResults.org). 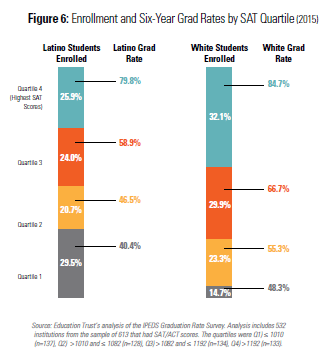 Unfortunately, there are also institutions with low and especially inequitable outcomes for Latino students. Among these is Mercy College in New York, where there is a 22.4 percentage point gap between Latino and White students. But just closing the gap at individual institutions is not enough to erase the national completion gap. To do so, more Latino students need the opportunity to attend selective institutions. About one-quarter of all Latino freshmen enroll at the most selective institutions where most freshmen graduate, while roughly one-third enroll at more accessible institutions where few complete a degree. But one-third of their White peers enroll at the most selective institutions, and less than one-fifth enroll at the least selective. To eradicate the completion gap, institutional leaders at selective colleges and universities need to enroll more Latino students. Latinos make up 18 percent of the US population but just 8.5 percent of students at selective institutions, the very places that have more resources to help students cross the finish line. Research shows that students who attend these colleges and universities are more likely to complete their degrees. Many will argue that differences in graduation rates are caused by differences in student preparation and other factors that are outside an institution’s control. Some of this is true, but for years, the Education Trust has shown that institutions can make a big difference. Similar colleges serving similar students can produce vastly different outcomes, proving that what institutions do for (and with) the students they serve matters a great deal. Take, for example, these two peers: University of Texas San Antonio and California State University Fullerton. These universities have similar student bodies with similar levels of preparation, but very dissimilar outcomes for their Latino students. Student success can only be improved when it is the top priority of institutional leaders. 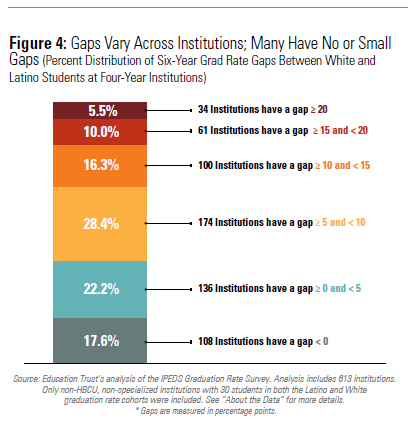 This report, and our earlier reports, including A Look at Black Student Success, all show that institutions committed to improving graduation rates for students from low-income families and students of color can make it happen.